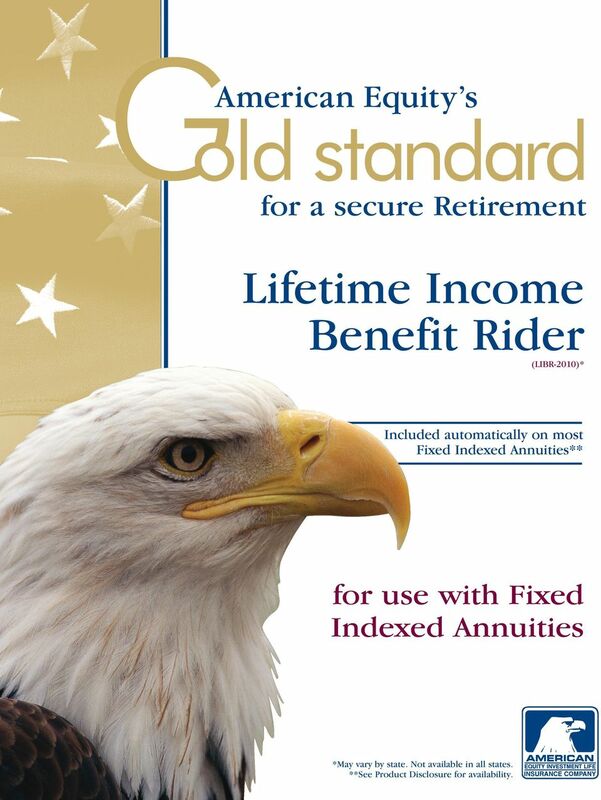 Download "Lifetime Income Benefit Rider"
1 for a secure Retirement Lifetime Income Benefit Rider (LIBR-2010)* Included automatically on most Fixed Indexed Annuities** for use with Fixed Indexed Annuities *May vary by state. Not available in all states. **See Product Disclosure for availability. 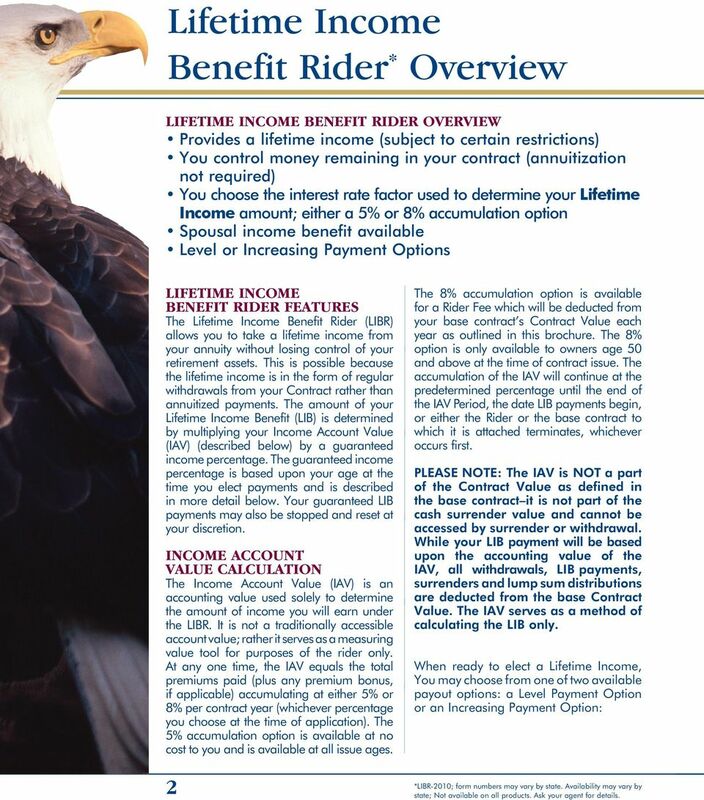 2 Lifetime Income Benefit Rider * Overview LIFETIME INCOME BENEFIT RIDER OVERVIEW Provides a lifetime income (subject to certain restrictions) You control money remaining in your contract (annuitization not required) You choose the interest rate factor used to determine your Lifetime Income amount; either a 5% or 8% accumulation option Spousal income benefit available Level or Increasing Payment Options LIFETIME INCOME BENEFIT RIDER FEATURES The Lifetime Income Benefit Rider (LIBR) allows you to take a lifetime income from your annuity without losing control of your retirement assets. This is possible because the lifetime income is in the form of regular withdrawals from your Contract rather than annuitized payments. The amount of your Lifetime Income Benefit (LIB) is determined by multiplying your Income Account Value (IAV) (described below) by a guaranteed income percentage. The guaranteed income percentage is based upon your age at the time you elect payments and is described in more detail below. Your guaranteed LIB payments may also be stopped and reset at your discretion. INCOME ACCOUNT VALUE CALCULATION The Income Account Value (IAV) is an accounting value used solely to determine the amount of income you will earn under the LIBR. It is not a traditionally accessible account value; rather it serves as a measuring value tool for purposes of the rider only. At any one time, the IAV equals the total premiums paid (plus any premium bonus, if applicable) accumulating at either 5% or 8% per contract year (whichever percentage you choose at the time of application). The 5% accumulation option is available at no cost to you and is available at all issue ages. 2 The 8% accumulation option is available for a Rider Fee which will be deducted from your base contract s Contract Value each year as outlined in this brochure. The 8% option is only available to owners age 50 and above at the time of contract issue. The accumulation of the IAV will continue at the predetermined percentage until the end of the IAV Period, the date LIB payments begin, or either the Rider or the base contract to which it is attached terminates, whichever occurs first. PLEASE NOTE: The IAV is NOT a part of the Contract Value as defined in the base contract it is not part of the cash surrender value and cannot be accessed by surrender or withdrawal. While your LIB payment will be based upon the accounting value of the IAV, all withdrawals, LIB payments, surrenders and lump sum distributions are deducted from the base Contract Value. The IAV serves as a method of calculating the LIB only. When ready to elect a Lifetime Income, You may choose from one of two available payout options: a Level Payment Option or an Increasing Payment Option: *LIBR-2010; form numbers may vary by state. Availability may vary by state; Not available on all products. Ask your agent for details. 6 A Case Study determine the amount of income under the LIB. 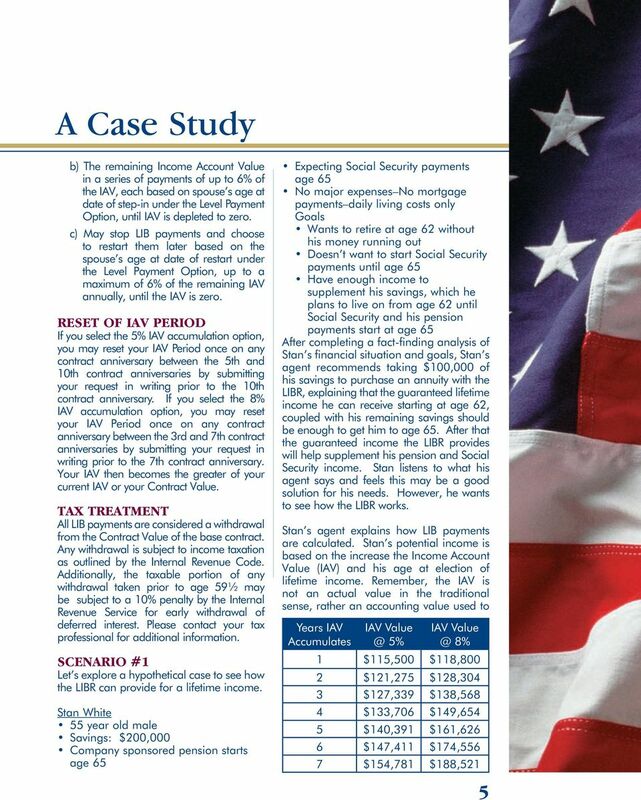 Stan s IAV is calculated by taking: $100,000 single premium plus 10% premium bonus; accumulating at 5% or 8% annually until payments begin; with No withdrawals prior to electing income; and Income is elected at the end of year seven when Stan turns age 62 The longer Stan waits to start LIB payments, the greater the accumulation of the IAV. Of course, if LIB payments are not elected, and the IAV period is reset, the IAV will continue to accumulate until the end of the IAV period. Stan s agent also explains to him that the IAV is only accessible if Stan elects to start taking a lifetime income. Stan will not be able to withdraw a lump sum based on the IAV. SCENARIO #1 LEVEL PAYMENT OPTION Option #1 End of 7th Contract Year IAV accumulation option 5% Base Contract Value Accumulates 3% Annually* IAV Value Cumulative Rider Fee Charged Base Contract Value Option #2 End of 7th Contract Year IAV accumulation option 8% Rider Fee 0.90% of Contract Value Annually Base Contract Value Accumulates 3% Annually* Stan wanted to see what options the LIBR provide him at his expected retirement at age 62. He also wants to know what the difference is between the 5% and 8% accumulation options. He asked his agent to show him his: IAV Value; LIB payments both level and increasing; Contract Value; Rider Fees paid for the 8% option; SCENARIO #2 INCREASING PAYMENT OPTION Stan liked what he saw, both his expected lifetime payment amounts, and the continued growth of his Contract Values. However, he was concerned about what inflation might do to his lifetime income and asked if there was some way to off-set some of the effects of inflation. Guaranteed Income % Annual LIB Payment (IAV x 5%) $154,781 $0 $135,286 5% $7,739 IAV Value Cumulative Rider Fee Charged Base Contract Value Guaranteed Income % Annual LIB Payment (IAV x 5%) $188,521 $7,597 $128,143 5% $9,426 6 * Hypothetical return; for illustration purposes only. Not a prediction of future performance. + The Rider Fee will continue to be taken against the Contract Value as long as the Contract is in force or until the LIBR terminates. 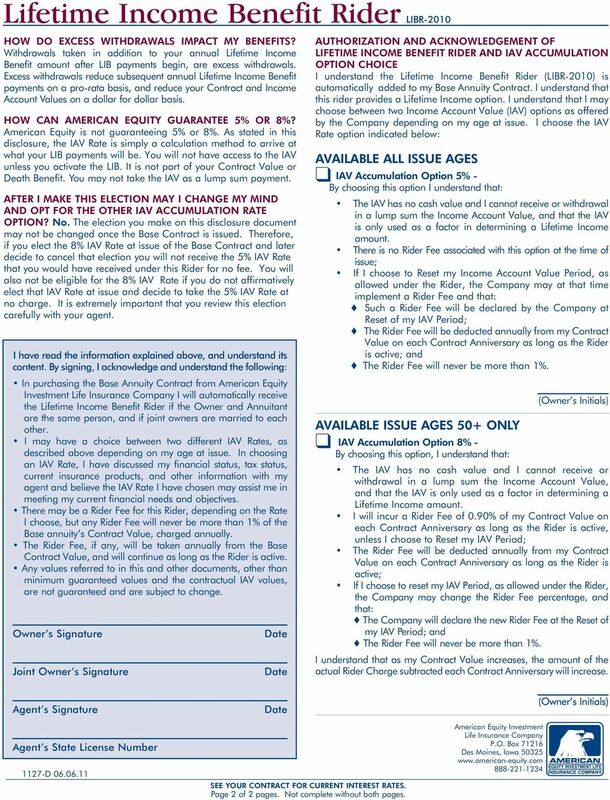 7 Lifetime Income Benefit Rider FIXED INDEXED ANNUITY VERSION DISCLOSURE STATEMENT LIBR-2010* Before purchasing an annuity with the Lifetime Income Benefit Rider (LIBR-2010), American Equity wants to make sure you understand the features of this Rider including all benefits, limitations, and costs. You should read through the brochure, and then go through the summary of information on this disclosure. Ask questions of your agent before making any decision. After you have read the information provided and your questions are answered, please sign the acknowledgement stating your understanding of the key provisions of the Rider. Please refer to the actual Rider for a complete description of the benefits, limitations, and costs. 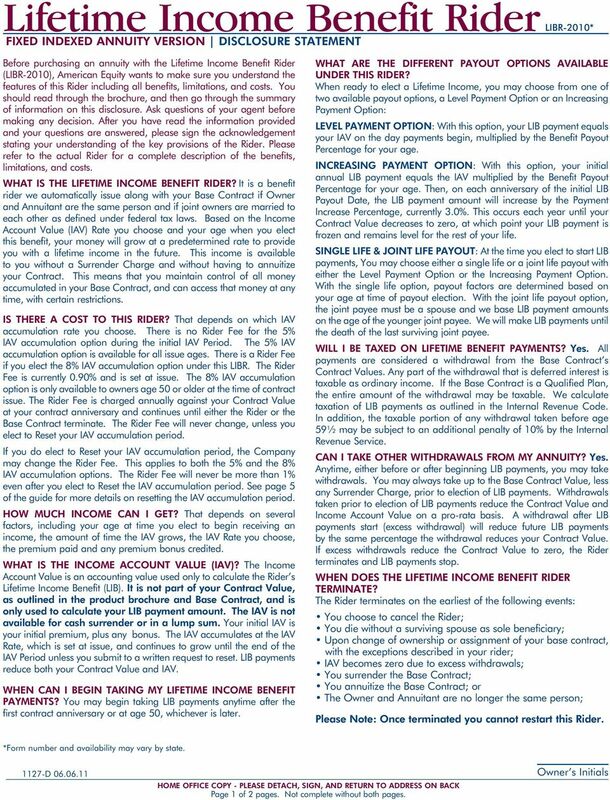 WHAT IS THE LIFETIME INCOME BENEFIT RIDER? It is a benefit rider we automatically issue along with your Base Contract if Owner and Annuitant are the same person and if joint owners are married to each other as defined under federal tax laws. Based on the Income Account Value (IAV) Rate you choose and your age when you elect this benefit, your money will grow at a predetermined rate to provide you with a lifetime income in the future. This income is available to you without a Surrender Charge and without having to annuitize your Contract. This means that you maintain control of all money accumulated in your Base Contract, and can access that money at any time, with certain restrictions. IS THERE A COST TO THIS RIDER? That depends on which IAV accumulation rate you choose. There is no Rider Fee for the 5% IAV accumulation option during the initial IAV Period. The 5% IAV accumulation option is available for all issue ages. 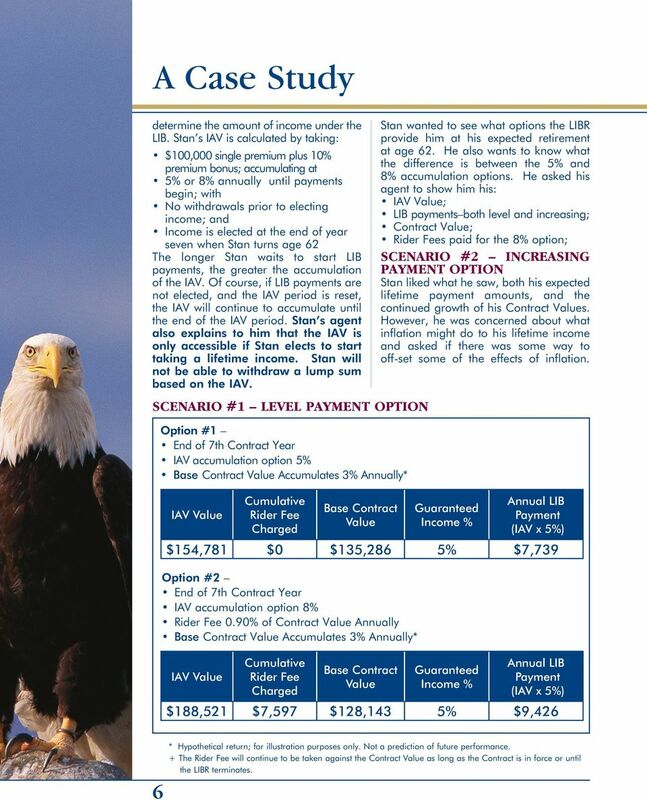 There is a Rider Fee if you elect the 8% IAV accumulation option under this LIBR. The Rider Fee is currently 0.90% and is set at issue. The 8% IAV accumulation option is only available to owners age 50 or older at the time of contract issue. The Rider Fee is charged annually against your Contract Value at your contract anniversary and continues until either the Rider or the Base Contract terminate. The Rider Fee will never change, unless you elect to Reset your IAV accumulation period. If you do elect to Reset your IAV accumulation period, the Company may change the Rider Fee. This applies to both the 5% and the 8% IAV accumulation options. The Rider Fee will never be more than 1% even after you elect to Reset the IAV accumulation period. See page 5 of the guide for more details on resetting the IAV accumulation period. HOW MUCH INCOME CAN I GET? That depends on several factors, including your age at time you elect to begin receiving an income, the amount of time the IAV grows, the IAV Rate you choose, the premium paid and any premium bonus credited. WHAT IS THE INCOME ACCOUNT VALUE (IAV)? The Income Account Value is an accounting value used only to calculate the Rider s Lifetime Income Benefit (LIB). It is not part of your Contract Value, as outlined in the product brochure and Base Contract, and is only used to calculate your LIB payment amount. The IAV is not available for cash surrender or in a lump sum. Your initial IAV is your initial premium, plus any bonus. The IAV accumulates at the IAV Rate, which is set at issue, and continues to grow until the end of the IAV Period unless you submit to a written request to reset. LIB payments reduce both your Contract Value and IAV. WHEN CAN I BEGIN TAKING MY LIFETIME INCOME BENEFIT PAYMENTS? You may begin taking LIB payments anytime after the first contract anniversary or at age 50, whichever is later. WHAT ARE THE DIFFERENT PAYOUT OPTIONS AVAILABLE UNDER THIS RIDER? 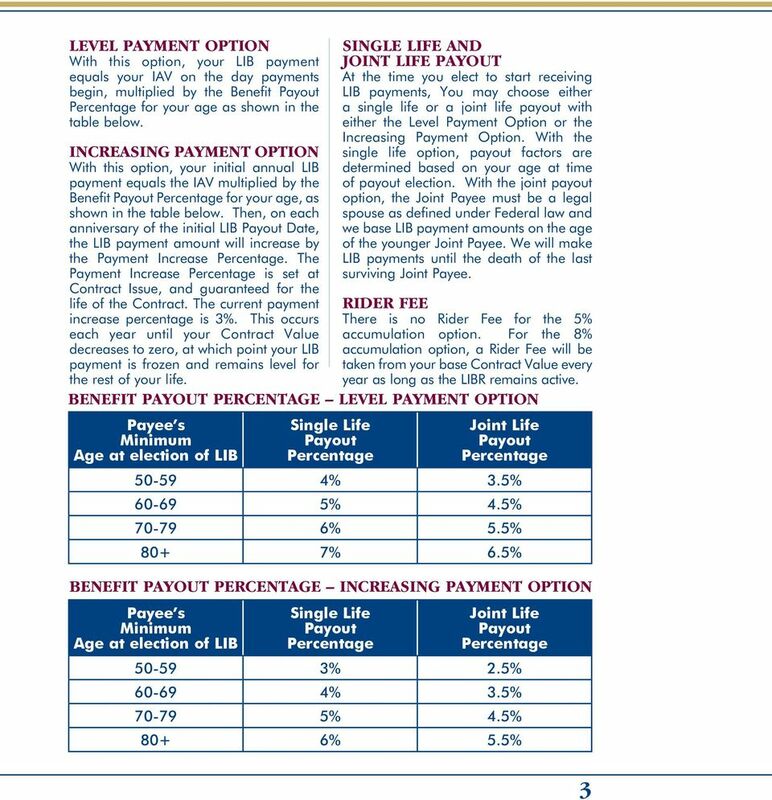 When ready to elect a Lifetime Income, you may choose from one of two available payout options, a Level Payment Option or an Increasing Payment Option: LEVEL PAYMENT OPTION: With this option, your LIB payment equals your IAV on the day payments begin, multiplied by the Benefit Payout Percentage for your age. 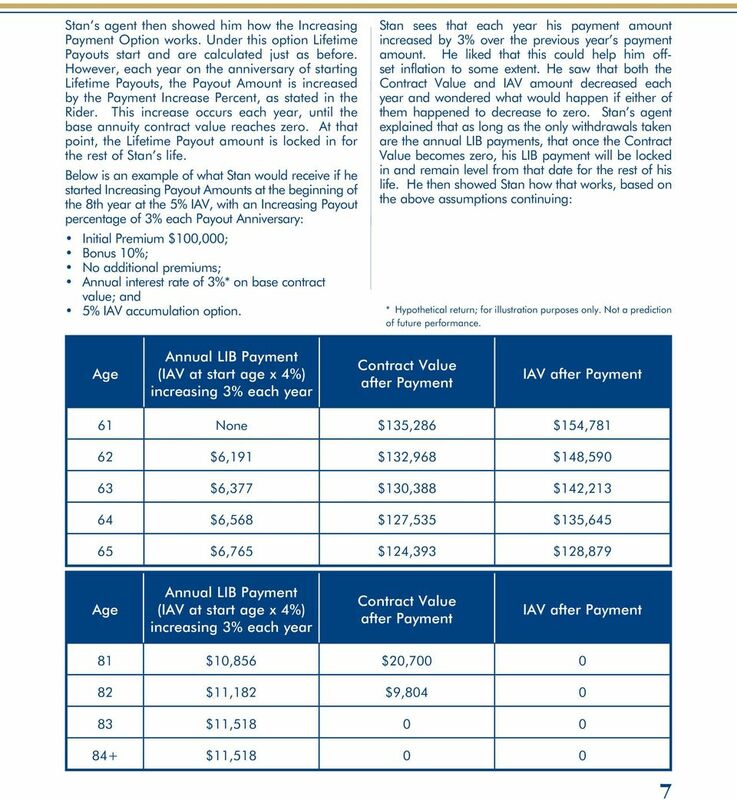 INCREASING PAYMENT OPTION: With this option, your initial annual LIB payment equals the IAV multiplied by the Benefit Payout Percentage for your age. Then, on each anniversary of the initial LIB Payout Date, the LIB payment amount will increase by the Payment Increase Percentage, currently 3.0%. This occurs each year until your Contract Value decreases to zero, at which point your LIB payment is frozen and remains level for the rest of your life. SINGLE LIFE & JOINT LIFE PAYOUT: At the time you elect to start LIB payments, You may choose either a single life or a joint life payout with either the Level Payment Option or the Increasing Payment Option. With the single life option, payout factors are determined based on your age at time of payout election. With the joint life payout option, the joint payee must be a spouse and we base LIB payment amounts on the age of the younger joint payee. We will make LIB payments until the death of the last surviving joint payee. WILL I BE TAXED ON LIFETIME BENEFIT PAYMENTS? Yes. All payments are considered a withdrawal from the Base Contract s Contract Values. Any part of the withdrawal that is deferred interest is taxable as ordinary income. If the Base Contract is a Qualified Plan, the entire amount of the withdrawal may be taxable. We calculate taxation of LIB payments as outlined in the Internal Revenue Code. In addition, the taxable portion of any withdrawal taken before age 59½ may be subject to an additional penalty of 10% by the Internal Revenue Service. CAN I TAKE OTHER WITHDRAWALS FROM MY ANNUITY? Yes. Anytime, either before or after beginning LIB payments, you may take withdrawals. You may always take up to the Base Contract Value, less any Surrender Charge, prior to election of LIB payments. Withdrawals taken prior to election of LIB payments reduce the Contract Value and Income Account Value on a pro-rata basis. A withdrawal after LIB payments start (excess withdrawal) will reduce future LIB payments by the same percentage the withdrawal reduces your Contract Value. If excess withdrawals reduce the Contract Value to zero, the Rider terminates and LIB payments stop. WHEN DOES THE LIFETIME INCOME BENEFIT RIDER TERMINATE? The Rider terminates on the earliest of the following events: You choose to cancel the Rider; You die without a surviving spouse as sole beneficiary; Upon change of ownership or assignment of your base contract, with the exceptions described in your rider; IAV becomes zero due to excess withdrawals; You surrender the Base Contract; You annuitize the Base Contract; or The Owner and Annuitant are no longer the same person; Please Note: Once terminated you cannot restart this Rider. *Form number and availability may vary by state D Owner s Initials Page 1 of 2 pages. Not complete without both pages. 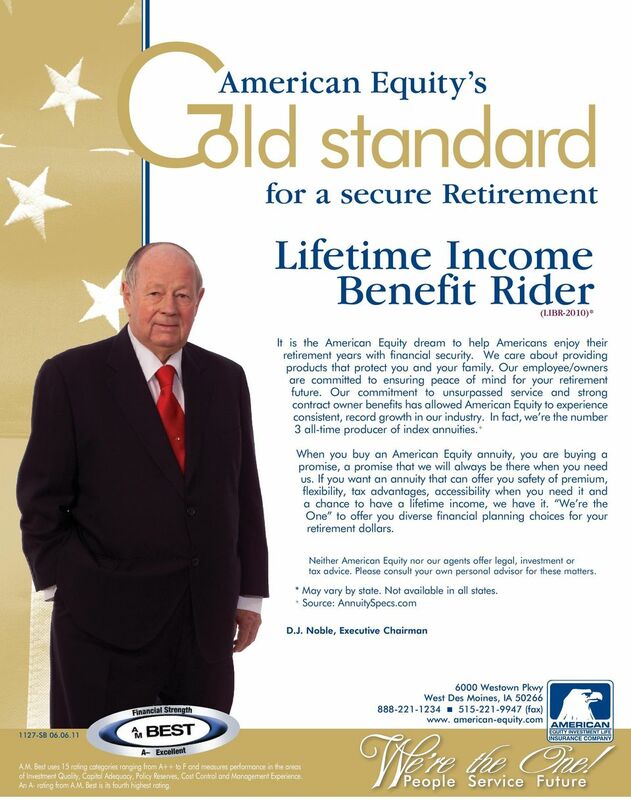 12 for a secure Retirement Lifetime Income Benefit Rider (LIBR-2010)* It is the American Equity dream to help Americans enjoy their retirement years with financial security. We care about providing products that protect you and your family. Our employee/owners are committed to ensuring peace of mind for your retirement future. Our commitment to unsurpassed service and strong contract owner benefits has allowed American Equity to experience consistent, record growth in our industry. In fact, we re the number 3 all-time producer of index annuities. + When you buy an American Equity annuity, you are buying a promise, a promise that we will always be there when you need us. If you want an annuity that can offer you safety of premium, flexibility, tax advantages, accessibility when you need it and a chance to have a lifetime income, we have it. We re the One to offer you diverse financial planning choices for your retirement dollars. Neither American Equity nor our agents offer legal, investment or tax advice. Please consult your own personal advisor for these matters. * May vary by state. Not available in all states. + Source: AnnuitySpecs.com D.J. Noble, Executive Chairman 1127-SB We answer the 6000 Westown phones! Pkwy West Des Moines, IA (fax) www. american-equity.com equity.com A.M. Best uses 15 rating categories ranging from A++ to F and measures performance in the areas of Investment Quality, Capital Adequacy, Policy Reserves, Cost Control and Management Experience. An A- rating from A.M. Best is its fourth highest rating. for a secure Retirement Retirement Gold (INDEX-2-09)* *Form number varies by state. for a secure Retirement Bonus Gold (INDEX-1-07)* *Form number varies by state. Voya Lifetime Income Income when it counts. A single premium deferred fixed annuity income solution issued by Voya Insurance and Annuity Company. Caution: Withdrawals made prior to age 59 ½ may be subject to a 10 percent federal penalty tax. ONcore Variable Annuities Guaranteed Lifetime Withdrawal Benefit Preferred IS Rider Building Your Retirement Income Strategy You ve spent years working hard and sacrificing to save money for your retirement. Heritage Gold. American Equity. Gold Standard for a Secure Retirement. The one who works for you! Choice 6. American Equity. Simple Choices for a Secure Retirement. The one who works for you! 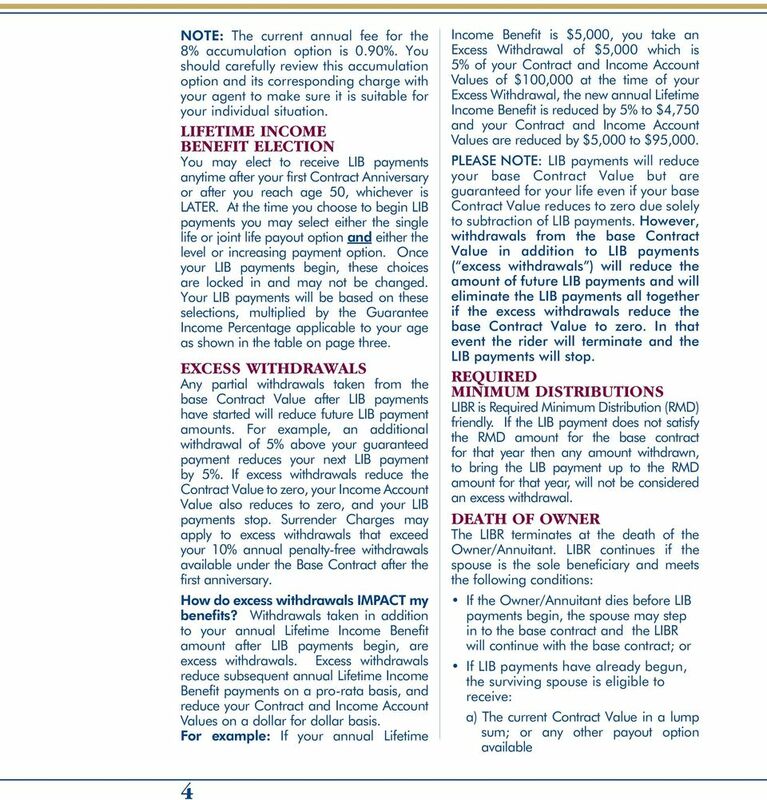 Guaranteed Withdrawal and Death Benefit Rider Great American Life Insurance Company R6032810NW Form number may vary by state. Guaranteed and Death Benefit Rider Great American Life Insurance Company R6032810NW Form number may vary by state. Introduction We offer a Guaranteed and Death Benefit through a rider to your annuity contract. Get Guaranteed Income for LIFE! Choose a new path for your retirement future. Choose a new path for your retirement future. Nationwide New Heights Fixed Indexed Annuity Guarantees and protections are subject to the claims-paying ability of Nationwide Life and Annuity Insurance Company. An Agent s Guide To Understanding American Equity s Indexed Annuities. Payouts. Protection. In One Place. - Provides minimum, guaranteed, periodic withdrawals for the life of the contract owner/annuitant. Flexible Premium Deferred Annuity Handbook Contents Overview of Annuities 3 Definition of Flexible Premium Deferred Annuity (FPDA) 4 What is the Difference Between a Qualified and Nonqualified Annuity? A GUIDE TO INVESTING IN ANNUITIES What Benefits Do Annuities Offer in Planning for Retirement? Oppenheimer Life Agency, Ltd. Oppenheimer Life Agency, Ltd., a wholly owned subsidiary of Oppenheimer & Co.
Be prepared for the opportunities retirement may offer. Introduction The Kentucky Department of Insurance is pleased to offer this Annuity Buyer s Guide as an aid to assist you in determining your insurance needs and the products that will fill those needs. WealthMark Advisory Services Philip Scholler President/CEO 5001 Horizons Drive Suite 201 Columbus, OH 43220 614-824-4352 phil@wealthmarkas.com www.wealthmarkas.com Inside Workbook: What Is a Variable Annuity? Choice 10. American Equity. Simple Choices for a Secure Retirement. The one who works for you! Bonus Gold. American Equity. Gold Standard for a Secure Retirement. The one who works for you!